Brazil has more than 90 million people in the labor market. 65% of Brazil's workers are employees, 22% are self­employed and the remaining 8% include trainees and volunteers. The Southeast region, the most populous region of Brazil, concentrates 52% of the country's workforce. Formal employment is concentrated in the manufacturing sector (65.34%), services sector (27.96%) and agriculture (6.7%). Brazilian workers are entitled to a statutory minimum wage. However, the average wage varies according to the economic sector in which the worker is placed. According to the Ministry of Labor, the average wage paid to Brazilian workers has increased at an annual rate of 3% over the years as a result of economic growth and the consequent increase in the industrial, commercial and service activities. In 2016, the minimum wage was established in R$ 880.00. 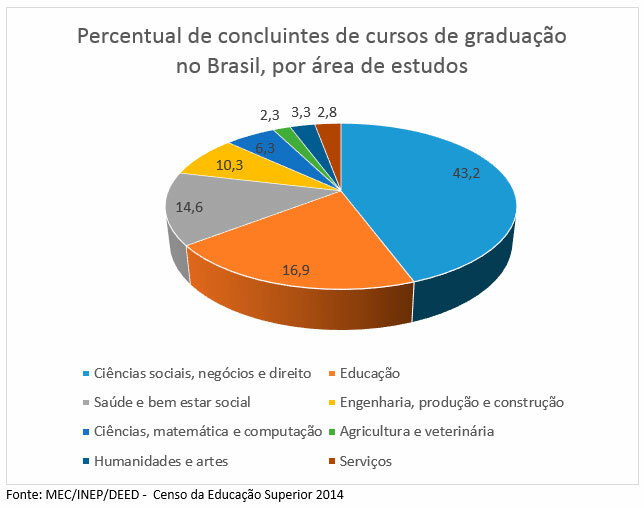 Brazil has 2,368 institutions of higher education, which deliver approximately 25 thousand on­site undergraduate courses, and 197.5 thousand public and private basic schools, which cover regular education (kindergarten, elementary, secondary and high school education), special education and young adult education (called EJA in Brazil). 1,126 institutions of higher education are located at the Southeast region, 452 in the Northeast, 402 in the South, 239 in the Mid­West and 149 in the North.